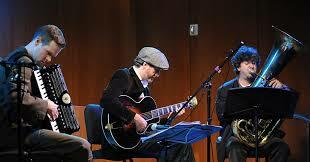 I appreciate the comfort of improvising on familiar themes: I haven’t tired of the blues or BODY AND SOUL. But even the most “traditional” of listeners can find that venturing beyond one’s fenced front yard can be uplifting. 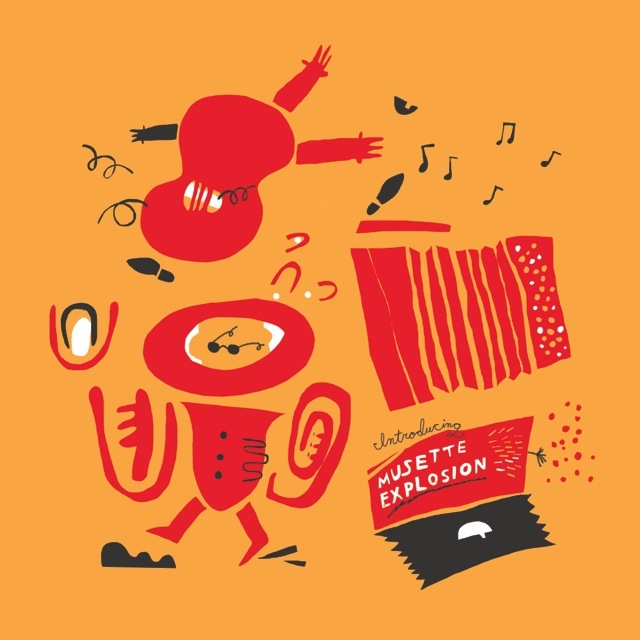 A new CD, INTRODUCING MUSETTE EXPLOSION, is a happy, bracing exploration of fresh fields and pastures new (the lively cover art, befitting the music, is by Na Kim). The three impish yet serious improvisers on this disc are Will Holshouser, accordion / compositions; Matt Munisteri, guitar and banjo; Marcus Rojas, tuba. The music they are exploring is French musette — dance-based pop music of Paris that flourished in the last century. A listener new to the form will hear some Django-connections, both literal (one of the compositions is the Reinhardt-Grappelli SWING 39) and whimsical — some songs are by the virtuoso accordionist Gus Viseur, others by guitarist Baro Ferret. But this isn’t another by-the-numbers Django-and-Stephane tribute, and the music has its own vivid energies, its own quirky turns. Each track seems a small musical drama all its own — not simply an attempt by jazz musicians to pretend to be French strolling street musicians, but their delightful variations within and around the form. This isn’t to suggest that the music is “contemporary classical,” with all the intellectual rigor implied by that name, because this trio swings. The performances are affectionate but I wouldn’t call them sentimental: no berets and striped sailor shirts are audible in this hour of music. In his notes, Will writes that he and Matt “got hooked” on French musette music — seduced by the “dark beauty and thrilling virtuosity” they heard in the classic recordings, “passionate and sweet, but played with a fierce edge — like jazz.” But rather than create a repertory project, another set of old records in contemporary fidelity, they brought jazz players’ vigor and willingness to explore to the songs and conventions they had grown to love, finding new ways to improvise on the material. And as brilliant as Will, Matt, and Marcus are as soloists, they come together marvelously as ensemble players — something is always going on in every performance, and this combination of instruments that would seem odd or unbalanced in other hands sounds complete and rich here. Those who are members of the Terry Gross Fan Club have already heard Will play and talk about this band and their music on NPR’s FRESH AIR, but that fascinating segment can be heard here. The band’s Facebook page is here. And the disc itself can be found in all the old familiar places: CD Baby, Amazon (may I gently urge readers to investigate Amazon Smile, where a percentage from one’s purchases goes to a charity one selects), or iTunes. I find this music happily atmospheric, so I offer a suggestion that is part challenge. I hope some creative film-school or drama-school type finds this music and begins to make short films, no dialogue needed, with each track as a central character in a theatre piece or a short film. Those who aren’t making films, writing, directing, or acting in theatre can simply buy copies of the disc or download it — rare pleasures are in store. The band PANIQUE is a rare group, subtle and inventive, as their appearance at the Red Poppy Art House in San Francisco proved. Click PANIQUE to be transported — in every possible way — back to their beautiful first set! This imaginative quartet is Vic Wong, guitar; Benito Cortez, violin; Nick Christie, rhythm guitar; Daniel Fabricant, string bass. Here is their second set. I so admire the conversational eloquence of their solos, delightful ensemble interplay; their dynamics, tempos, and shadings, their love 0f melody. Learn more about PANIQUE and their live CD here; visit Vic Wong on Facebook there. And The Red Poppy Art House is a remarkable place, full of friendship and inspirations: click Poppy to find out more.